We will however, take credit for being the first successful pioneers to combine an aluminum boat lift with hydraulic power and a safe 12 volt motor source along with great style and performance. It started with a desire - a passion – we know, it’s only a boat lift - we’ll try to keep it real… …but when you see up close what we did, you’ll understand if we sound a little ‘out there’. We love it, absolutely, positively love it. Crazy? Maybe. But ask yourself, if you’re going to build your dream house, buy an exotic car, enjoy a gourmet meal, or shoot scratch golf, wouldn’t you want those ‘passionate’ people on your staff - inventing, designing, building, testing, and encouraging… until… it’s perfect? It’s the mid 80’s, Ronald Reagan (the actor?) was president, the Dow was at 1,200 (it would triple by 1995, five years later it would break 10,000). A home on a lake was built, and a boat was purchased… A background in engineering and experience with hydraulic equipment would lead a local inventor to ask himself if there wasn’t a better mousetrap available. 4 months later, a crude version of today’s HL series was born… It was a 2,000# capacity, single cylinder, 12 volt, aluminum cantilever lift. We used a single acting snowplow cylinder, a hydraulic pump from the Grainger catalog and tested it with my father’s pontoon boat with 600# of brothers… Crude? No doubt. Successful – very much so. The following year we added a second cylinder and made it double acting, so now it lifted and retracted under power. We still bought our pumps from Grainger and raised the capacity to 2,500#, we rented space from a local welding shop and redesigned the hinges, it was called “The Genesis Sea Lift”. 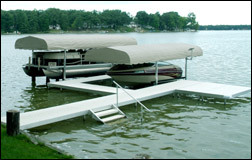 Founded in 1989 with one simple concept - Design and manufacture the best hydraulic boat lift on the Market - anywhere. 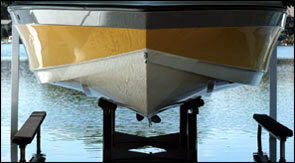 It started with a simplified version of the HL Series Lifts, 3 years earlier in 1986, to lift a 20’ Hydrostream tunnel. It was called the Genesis Sea Lift. Totally portable, clean looking, cable free, entirely hydraulic, fast, and completely powered with a self contained, safe 12 volt battery. It was a snap to assemble and easier to install than any of its winch and cable predecessors… With the advice of some close friends, and family, the Genesis Sea Lift made its debut at the Grand Rapids Boat Show in February 1990. Then again at the national dealer show IMTEC in 1992 – What was then, the first of its kind boat lift, is now, copied by several other major manufactures. That’s a nice compliment. Start Simple – Strive to be the best, always. Listen to your customers, always. Utilize the highest quality suppliers, always. Hire the most talented and dedicated people, always. Grow Steady – We’ve enjoyed double digit growth thanks to you, our customers. You’ve told your friends, and they told their friends. We even have second generation customers. What a great compliment. Thank-you! Stay Strong – Design products that solve problems, look great, and last longer than expected. We may never be the largest or the flashiest waterfront equipment company out there. Our only goal – to be the best, for you, our customer, you deserve it. Let us know how we’re doing. Compliment Who You Are - We strive everyday to be the the company with products you want to surround yourself with. Value added products that look great and perform well. Products that you are proud to own, display and recommend. What Our Customers Say - Elegant, clean, strong, reliable, safe, fast, timeless, detailed, well built, extremely well built. Please consider us further with a phone call, a visit to our factory, stop at our booth at a boat show, or contact one of our great dealers for a first hand look at why we believe we have the best looking, best built, best value hoist anywhere. There's more we need to show you. Summit Marine Wins National Title!